Eagles are magnificent birds and therefore fun to photograph. You will need a telephoto lens and know where to find them. There are two places I go to find them. One is Lake Minocqua in Wisconsin. There is a resort on the lake where, if you have the right room, you can walk out on the deck and photograph them as much as you want (at about 5:00am they will let you know when they are ready). The other area, closer to home, is the Mississippi River. Between Alton and Louisiana (MO) there are great areas to view Eagles.This is our “Great Rivers” area. For those that would like to find out more, visit Meeting of the Great Rivers All Around Alton. 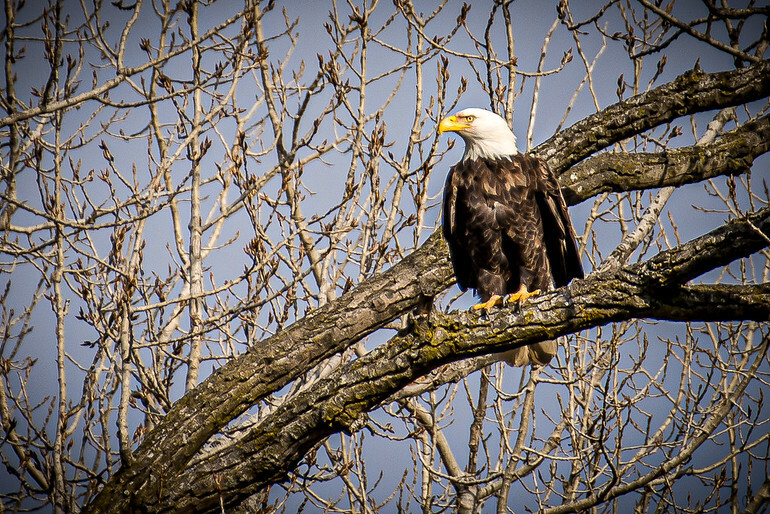 A friend and I drove around the backwaters of the Mississippi near St. Charles, MO and came across this guy.